Very weird solving experience. Got nowhere in the NW, then blazed through everything else, only to end up back at the NW, stuck again. Half my solving time, at least, was spent stuck in that corner (despite my having NOUS, DURST (21A: Limp Bizkit frontman Fred), and "I'M HURT"). Even when I was able (finally) to back myself into stuff I just didn't know (ZITI) (23A: Ingredient in some pastitsio) or couldn't see at first (NETIZEN, GRAVITY), I was stuck for a bit. 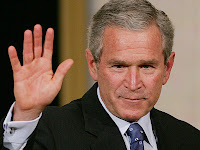 Once again, the culprit was wrong answers: specifically, "AM I LYING?" for 1A: "You doubt me?" ("AM I WRONG?") and INT for 25A: Football stat. (ATT). Didn't know OVID (despite loving his poetry) (6D: J. M. W. Turner's "___ Banished From Rome") and didn't know WEISS and so ... well, not GAME OVER, but it felt like it, for a bit. Somehow was able to see MAX OUT despite having a wrong "N" in that terminal space, and took the puzzle down from there. Seriously, I don't even remember what happened with the other 75-80% of the grid. I flew through it like it was Tuesday. As of right now, I have no idea what "TWO!" is supposed to mean as an answer to 34D: Shout repeated at a basketball game. I have attended many basketball games in my life, and this "shout" has never happened. Who is shouting it? Why? Mystifying. The only halfway decent rationale I've heard for this clue (from Jeffrey K, on Twitter) is that the ref is shouting it, as the ball is in the air, to indicate that the shot was a 2-pointer and not, as it might've appeared on a long jump shot, a 3-pointer. But this is a stretch. Nothing else in this puzzle registered much with me. I had EVENNESS (?) instead of EVEN KEEL for a few seconds. But otherwise, my only minor- to major struggles were north and west of the ACE TEN line (26A: 21 in blackjack). I like the underwaterness of DIVING BELL (19A: Relative of a bathysphere) and AQUA-LUNG (56A: Breather?) sharing space in this grid. I should probably praise the hell out of the smoothness of the grid, esp. given those big, open corners in the NE and SW. I just wish they'd made more of an impression. THEME: EAST TO WEST (60A: How 17-, 23-, 37- and 51-Across run (in two ways))— theme answers run backward (i.e. literally east to west), and also run from "E" to "W" (i.e. figuratively east to west). As far as I was concerned, while I was solving the puzzle, it was just a "these answers go backward" puzzle. I'd seen answers do that before, so I couldn't figure out what the big deal was. Only after I was done did I see the E-to-W angle, which does make the whole endeavor somewhat interesting. The grid is pretty clean and has solid if not sparkly answers. I was lucky enough to have three of the long answers—OMAR EPPS, LOS LOBOS, and JEANNIE—be utter gimmes, which is what pulled this puzzle toward the Easy side. The backward thing took a little time to pick up on. 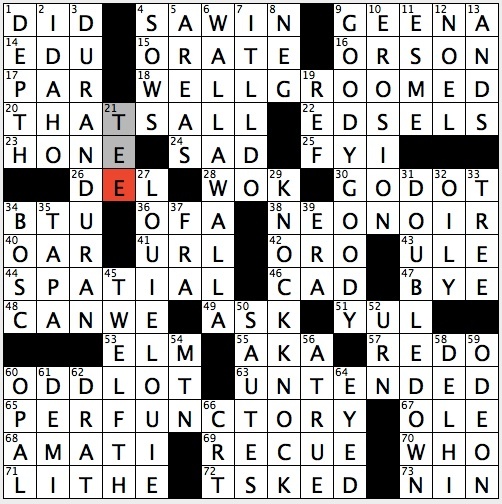 I had 23-Across ending -TIXE, and I knew no words had that ending. Figured I had an error, but all the crosses held tight. Eventually my eye caught the revealer clue, and even before I knew the revealer answer, I knew my themers were going backward. Once you pick up the conceit, it's not that hard a puzzle. Elinor WYLIE eluded me, and LIANE Balaban, as well as the movie she's clued by, are completely new to me. 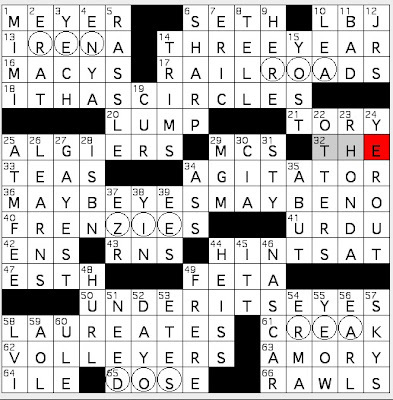 That's an insane LIANE clue, though I'm guessing that, with the NYT-solving crowd, LIANE Hansen in gonna be just too easy, no matter how you clue her (for years she hosted NPR's "Weekend Edition Sunday," a show on which Will Shortz makes a weekly appearance). Love love love the JACK / KIRBY answer, with its "K" crossing. 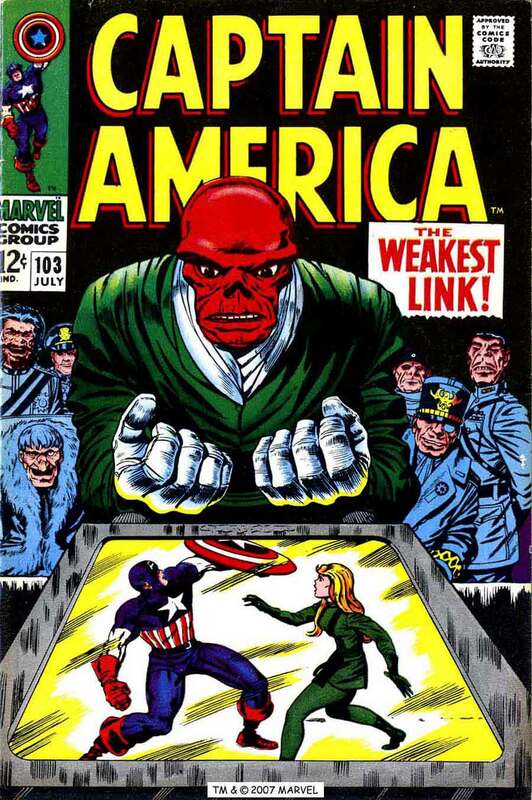 Nice to see a comics legend get some grid face time. I like NAGGY slightly less than I like the EGGY that it crosses, which is to say, I don't like it. Seemed like there were a bunch of oddish plurals, but I really see only three that fit that description. 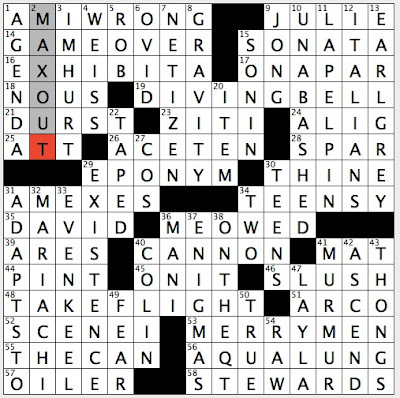 Perhaps I thought there were more because the worst of them is at 1-Across (1A: "Humbug" preceders = BAHS; truly terrible). Because the center theme answer was bookended by two obscurish proper nouns, I found the middle the hardest section to get into. Even with VI- and RE-, I couldn't get either 24D: Trattoria menu offering or 25D: It's sat upon. Had to come in to that section from the bottom. 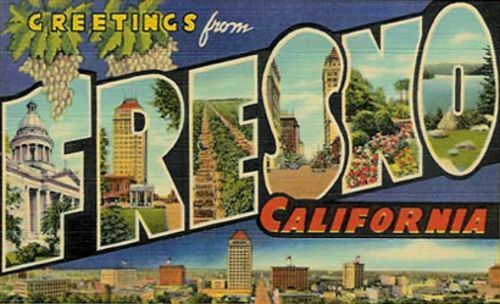 My home town makes a rare appearance today—I was never that excited to live there, but now whenever FRESNO comes up I feel a strange tinge of nostalgia (9D: San Joaquin Valley city). Ronan Tynan (born 14 May 1960) is a singer in the classical Irish style. I found this one fussy and rather unpleasant to solve. I get that the intersecting words form a visually literal representation of the phrase that they're part of, and I acknowledge that that is indeed clever. Still, as a solving exercise, having to work out a lot of niddling 4x4s, with their "with this"s and "see that"s, is not my idea of a good time. I should add that "TAKE in VAIN" is a reeeeeeal outlier, thematically, as it does not stand alone as a phrase At All (where the other theme answers all very much do). 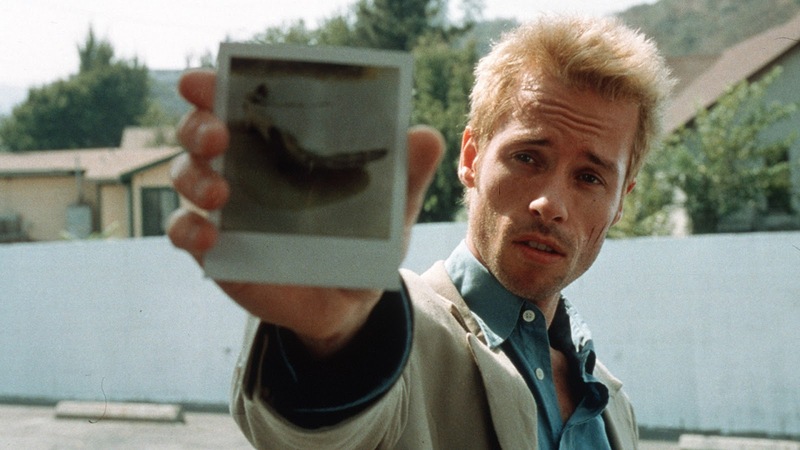 But my feelings today are mostly just a matter of taste—I didn't enjoy the puzzle that much, but I do think it's well put-together. I just got a little LOGY toward the bottom of the grid (57D: Feeling sluggish). Time ended up normal (5-ish), so I don't feel that bad. Hey, look, it's 4-time American Crossword Puzzle Tournament Champion Dan Feyer, a man who can solve brutal puzzle in times that most people would (literally) not believe, and he's made a very solvable (not to mention delightful) Tuesday puzzle. Simple gimmick leads to genuinely amusing and clever theme answers, all in a grid that is both clean and interesting. I didn't have any problems solving it, but as soon as my wife said "well I'm going to have to make an educated guess at one square," I knew exactly what square she was talking about: THICKE / ECKO. She wanted to put "C" there, and I was like "What? Why would you do that?" and she said "OK, then it's 'K', I don't know ... you know how it is with *names* ..." And I do. 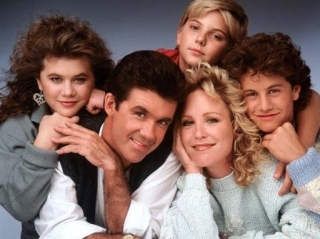 Alan THICKE hasn't really been heard from since "Growing Pains," but in the '80s he was pretty famous both for that show and his failed late-night talk show. 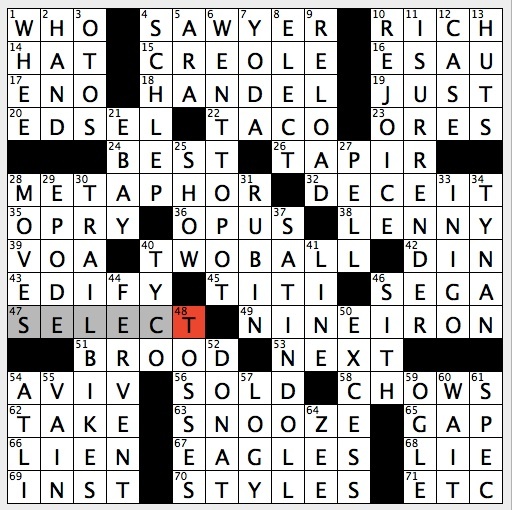 My favorite part of the solve today was hitting the *second* "Growing Pains" clue (47D: "Growing Pains" family name = SEAVER). I loved that show as a kid, both because it was pretty funny and because I had a thing for Joanna Kearns. Yes, as a teenager, my tastes ran more to sitcom moms than supermodels. In my defense, she was hot. Meanwhile, Alan THICKE's son is now a successful R&B singer. Had to think here and there about a few answers. Stumped by 14A: Extra Dry brand (ARRID) because I figured it had to be a beer (or BREWSKI). "Starting with A ... ASAHI?" No. Not even close. 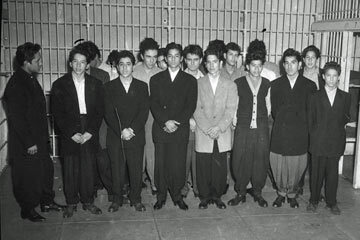 I don't think of HEPCATs wearing ZOOT suits (21D: Cool one, once + 16A: Kind of suit worn by a 21-Down). I associate the suits more with a black/latino subculture in the '40s, whereas I associate HEPCATs with beatniks of the '50s. I'm sure there's some overlap, but that clue didn't quite work for me. ECKO (62A: Designer Marc) and SKIL (6A: Big name in power tools) are potentially tough, as brand names go—I don't think of them as very mainstream; I mean, not OREO-mainstream, anyway. Took me forever to parse I BLEW IT (34D: "My goof!"). Took me a second to remember there had once been a Chuck ROBB (23D: Former Virginia senator Chuck). Walla Walla is the largest city in and the county seat of Walla Walla County,Washington, United States. 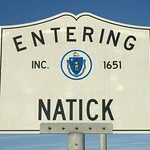 The population was 31,731 at the 2010 census. Walla Walla is in the southeastern region of Washington, approximately four hours by car from Portland, Oregon and Seattle, Washington and thirteen miles from the Oregon border. Whitman College, Walla Walla Community College, and the Washington State Penitentiary are located in Walla Walla. Walla Walla University is located in nearby College Place, Washington. Baker Boyer Bank, the oldest bank in the state of Washington, was founded in Walla Walla in 1869. Walla Walla is famous for its sweet onions. Many wineries are located in the area. I did this puzzle in 2:46, which is as fast as I've been in a Long time. Fun fact—I almost went to school in WALLA WALLA (Whitman College, to be exact). My entire family is from the Pacific Northwest, which is the only reason that school was even on my radar. Very mixed feelings about this one. On the one hand, it's just repeated words. 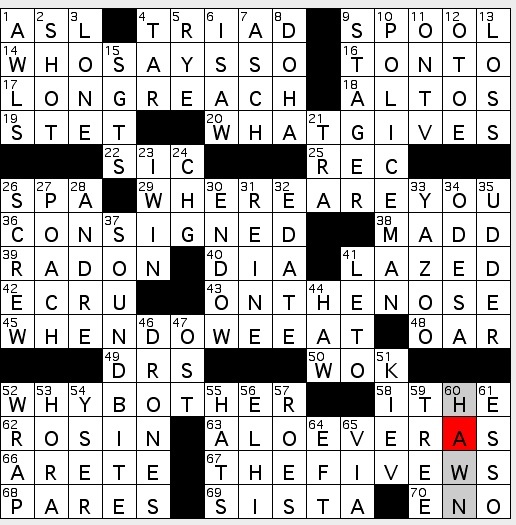 On the other, it's got a great revealer, and the Downward theme answers give this Monday puzzle a nice twist. Back to the first hand, the fill is mediocre-to-terrible in several parts, largely because the grid is a. thematically dense and b. filled with 3- and 4-letter words (I might have literally choked on the CRT / RECUE / TSKED section). But, returning to the other hand, the long Acrosses are nice, and NEO-NOIR is byootiful (38A: Modern film genre with dark themes). So ... there you have it. In a nutshell. Mixed nuts. Mixed nutshells. I'm ceasing to make sense, so I'm gonna go watch the first episode of the new season of "Arrested Development" now. Oh, and a reminder to those of you who like easy puzzles (T-W level) and want to expand your horizons with some contemporary crosswords based on the week's news, go sign up for Peter Gordon's "Fireball Newsweekly Crosswords" — get in for as little as $5. Details HERE. The Interstate Commerce Commission (ICC) was a regulatory agency in theUnited States created by the Interstate Commerce Act of 1887. The agency's original purpose was to regulate railroads (and later trucking) to ensure fair rates, to eliminate rate discrimination, and to regulate other aspects of common carriers, including interstate bus lines and telephone companies. Congress expanded ICC authority to regulate other modes of commerce beginning in 1906. The agency was abolished in 1995, and its remaining functions were transferred to the Surface Transportation Board. Tons of fun — assuming you keep *relatively* current on movies and television. Actually, nothing here feels very obscure or come-lately. I think "GLEE" is about the most recent title in any of the theme answers, and that show's a big enough hit that virtually everyone will at least have heard of it. 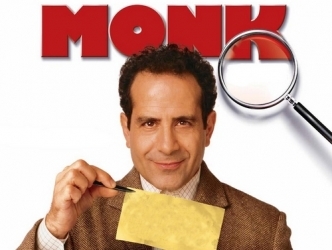 Maybe some people forgot about "MONK"? No big deal, since the crosses and the clue make it inferrable. I think I might like / admire the theme a little more if the TV shows were, in every case, shoved inside the movie titles—then it would seem like the movie title was primary, and then altered (i.e. re-"made") with a TV show. So essentially you'd need to ditch theme answers 1 and 3 ... but those two are funny enough for me not to care *that* much about the inconsistency. All the TV titles are just one word, so there is a kind of consistency there. The only thing that really bothered me about the puzzle is the SW corner. A bygone governmental initialism crossing CAIRENE (a word I have never seen in my life until this puzzle)!?!? I ran the alphabet and still had nothing. Considered ZAIRENE (a native of Zaire??? ), but knew that there was no way a "Z" was going to be in a regulatory agcy. name. Then I re-ran the alphabet, slower this time, and saw the "Cairo" connection. Puzzle still done in better than average time, but I really could've done without that bit of obscurity/ugliness. In a corner that's already weighed down by A MENU, that crossing was a little much. Started out very fast in the NW, but then slowed down. Ended up getting huge swaths of the puzzle done before I ever really understood the theme. Eventually had OUT ... OF AFRICA, then mentally filled in "HOUSE" to complete the joke, and (Aha!) I had my theme. There were a couple WTF-type answers in the grid (beyond ICC / CAIRENE). 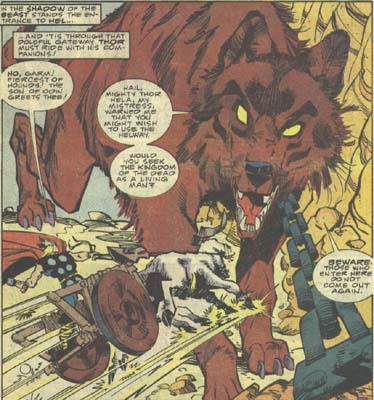 I thought I had at least a passing familiarity with Norse mythology, but I cannot remember ever learning about GARM (52D: Hellhound of Norse mythology). And TGV? It means "Train à Grand Vitesse" (i.e. "high-speed train"). News to me (79D: French high-speed rail inits.). Those were three random letters, as far as I was concerned. But again, my ignorance of this stuff didn't hold me back much, since the crosses were fair and mostly quite easy. 1A: Friends in a pub (MATES) — good clue. Confused me. I think the foreignness of "pub" didn't register w/ me. 13A: Baroque French dance (GAVOTTE) — that thing that you watched yourself doing when you were being so vain that you probably thought that song was about you. If you don't know your French dances (or your Carly Simon) (or the fact that Eli went to OLE MISS), that NE corner might've proved a bit tricky. 58A: NBC newsman Holt (LESTER) — I like him. It's hard (for me) to take contemporary news anchors seriously, but he seems to do a pretty good job, from the little I've seen. 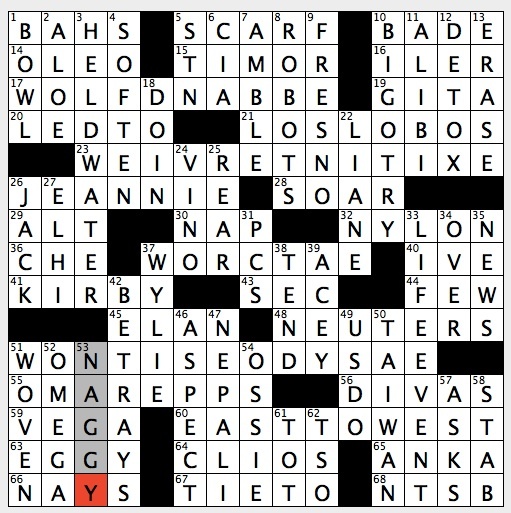 76A: Old French line (ROIS) — I like this clue. Something about the vagueness of "line" makes it interesting. 90A: "Stoutly-built" Dickens villain (SIKES) — I've read one Dickens novel in my life, I think, and not the ones one usually reads. I read Our Mutual Friend. This is to say, I have no idea what novel this SIKES guy is from. Oh look, it's Oliver Twist. OK, then. 12D: Santiago's milieu in a Hemingway novel (THE SEA) — Pretty sure I've never read The Old Man... either. Plenty of Hemingway short stories, but novels—not so much. 95D: "I Never Played the Game" memoirist (COSELL) — also never read this, though I suspect I'm less alone on that count. I got this easily, and it really helped me round the corner down into that southern section. I have two great independent puzzle projects to tell you about, but since I don't want to overwhelm you with information, I'm going to hold off talking about one until next week. 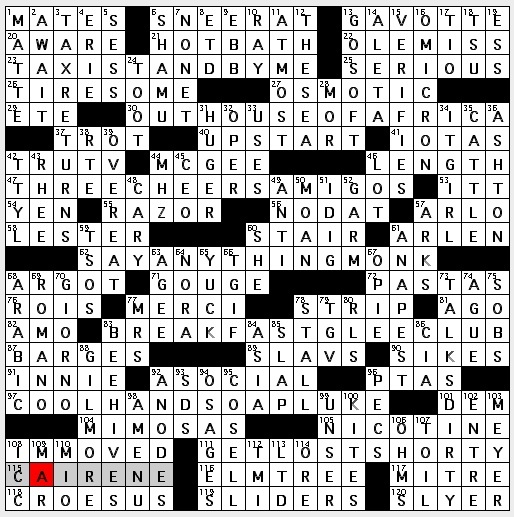 THIS week the project you really ought to get in on (if you are a puzzle junkie who is desperate for really good, finely edited, and very up-to-the-minute fare) is Peter Gordon's new Kickstarter venture, "Fireball Newsweekly Crosswords." For over four years, Peter wrote a puzzle every week for the magazine The Week, specifically about the previous week's news (this is what I mean by "up-to-the-minute"). He's now seeking to do the same thing independently, in a way that allows the puzzles to be even more current (puzzles are delivered instantly, the moment they're done). He's an exemplary constructor as well as the best editor in the business. The "Fireball Newsweekly Crosswords" are designed to be about T or W-level of difficulty (unlike his regular "Fireball Crosswords," which are Very hard ... as well as Very awesome—frankly, you should subscribe to them, too). Peter's are the first (and so far only) puzzles for which I've ever written a book cover blurb. 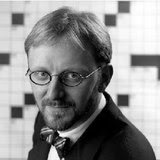 Read his detailed and informative description of "Fireball Newsweekly Crosswords" here, and then support the project. Inexpensive and *well* worth it. A haboob (Arabic: هَبوب‎ "blasting/drafting") is a type of intense dust storm carried on an atmospheric gravity current. 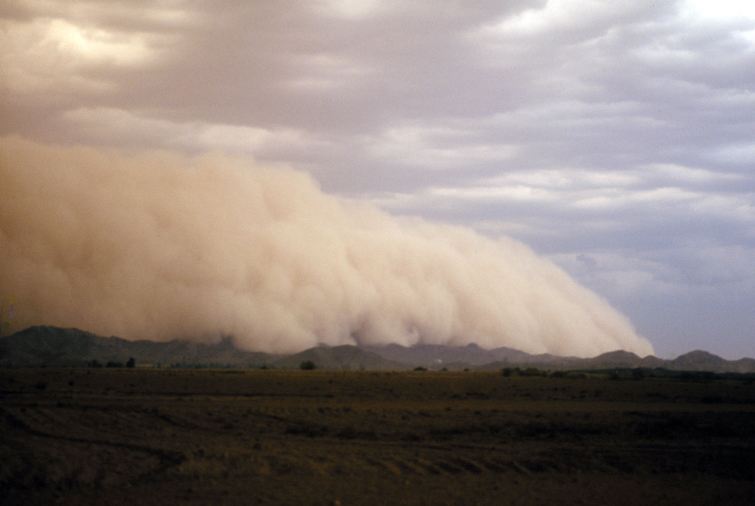 Haboobs occur regularly in arid regions throughout the world. Yesterday we got THE SAHARA DESERT, and today, the inevitable HABOOB. Fitting that my one moment of real struggle in this puzzle happened in the middle (literally, in the middle) of a blinding HABOOB. HABOOB HABOOB HABOOB. OK, I think I got that out of my system. My issue with HABOOB was the first "B"—a letter that felt like a guess, since I couldn't (can't) see how [Blacks out] gets you BANS. They seem only vaguely metaphorically related. But aside from that moment of awkwardness, the rest of the puzzle seemed both solid and delightful. Thorny, but in a way that allowed for consistent progress. Got a little worried in that SE corner, since I was not able to drop *any* answers down into it at first. Guessed RBIS, which allowed me to finally see that the EGG was in ROLL form (42D: Cylindrical menu item). I was imagining cylindrical omelets. Also, EGG creams. Got back ends of all the long Acrosses down there, and then PATSY CLINE slid into place and I had a clear path home from there (63A: "So Wrong" singer, 1962). 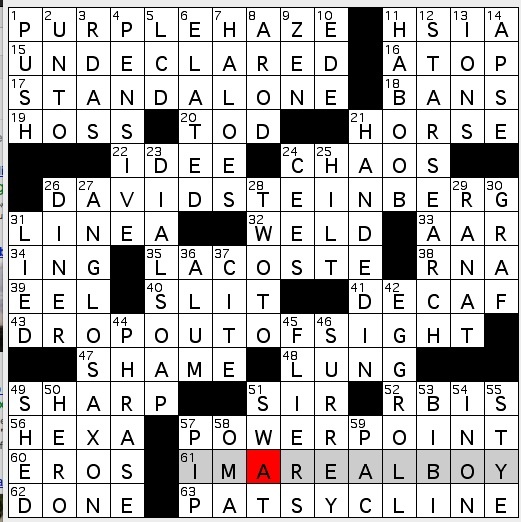 I find the whole self-referential thing (which constructors pull from time to time) a bit off-putting, and today is no exception, though I have to say, putting your *entire* name in the grid, all fourteen letters of it, is admirably ballsy, in a way (26A: Stand-up comic known for irreverent sermonettes = DAVID STEINBERG). Is Jeter really called "Mr. November"? (8D: Longtime teammate of Mr. November = A-ROD) Ugh. Stupid name. 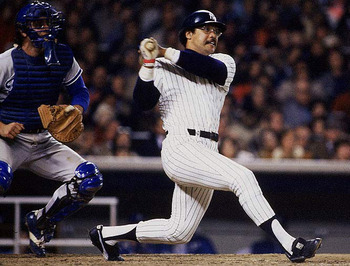 There's one Mr. [Month], and that's Reggie Jackson. Why would you want to be some kind of ersatz Reggie? I saw Reggie Jackson at a restaurant in Monterey last year. I probably told you. That was thrilling. Seeing Jeter ... wouldn't be. But I'm middle-aged, so this makes sense. Took me what felt like ForEver to see PHRASE at 44D: What outer space is that cyberspace isn't? 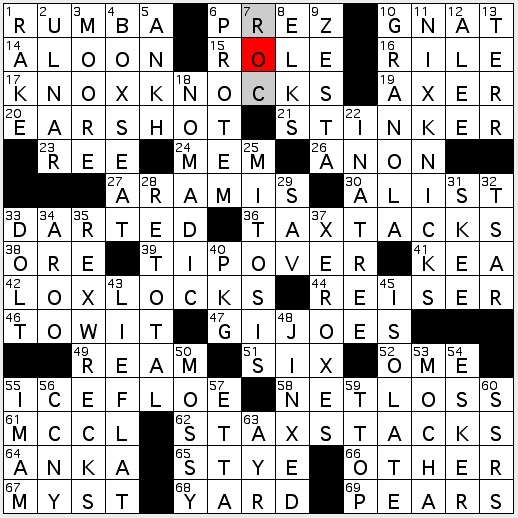 It's a great clue, but my first answer was [drum roll] — THREE D! Best wrong answer I've had in a while. Somehow the tune of "all in my brain" sprang up in my brain instantly, but it kept looping and not getting me to the words I needed (i.e. "PURPLE HAZE") (1A: What's "all in my brain," in a 1967 rock classic). What kept coming up instead? JUNGLE LOVE. Which is driving me mad, making me crazy, and fitting in the allotted space, but is not, sadly, all in my brain. Other screw-ups: SCAR for SLIT (40A: Operation creation). CRT for LCD (5D: Monitor option, briefly). OPA (?) for OMA (58D: German granny). I think that's it. 11A: Dynasty founded by Yu the Great (HSIA) — really glad I'd heard of this dynasty; otherwise, that HABOOB would've been way more destructive. 21A: Preakness, e.g. (HORSE) — I knew it was a HORSE *race* ... but not a HORSE. Really, really didn't trust that answer, even when all the letters fell right into place. 1D: Labor leader's cry? ("PUSH!") — nicely done. Probably my favorite clue of the day. 12D: Old TV show hosted by Ed McMahon ("STAR SEARCH") — ouch. Do *not* like it when staples of my youth are called "old," but I supposed I'd better just get used to it. any of numerous chiefly insectivorous New World lizards of the genus Anolis, related to the iguana, that have the ability to change the color of their skin among a wide range of green and brown shades. Who's a cute little lizard that's in crosswords too much? You are! Yes you are! Also, I had no idea until tonight that ANOLE has three syllables. I expect to use this new information precisely zero times. Tyler Hinman here, stepping in for Rex for reasons that I don't think are clear to anyone. I woke up at 4:30 AM today and suffered through a two-hour flight delay that put me in NYC with no viable way to get to my destination in Connecticut until tomorrow. So I am tired and stabby and I really really want to hate this puzzle so the spleen a-bubblin' inside me can spew forth in a fashion that won't get me jail time. Said thumb takes a more downward angle when considering the short fill, though not as much as I expected. There's yucky stuff like ASBIG, ASHIP, OYS, and RETAP, and plenty of other shorter words that won't do much for anybody. However, RETAP is the only one I'd consider egregious; I refuse to believe anyone has ever earnestly used that word. ALEXI — Fortunately, I knew Alexi Lalas cold, which went a long way towards preventing the RETAP/ANOLE/ALEXI/PEREC cluster from being a clusterf... well, you know. I wonder how many solvers will get stuck here. PROCRASTINATING — Not the liveliest 15, but a nice clue earns a tip o' the cap from me. CARELESSABANDON — I just now noticed this one. Isn't it usually RECKLESS ABANDON? Has decent Google support; I'll give it a pass. Overall, I think this is better than, say, an average quad-stack puzzle. An A grade feels generous for it, but a D is likely harsh. Whether it's a B or C depends largely on how you feel about the large number of three-letter entries. It's not something I usually notice, but if you're ever going to notice it, this is the puzzle. Given my aforementioned stressors, not to mention the fact that I just discovered my laptop screen hinge is completely broken and I can't close it anymore, I'm going to permit myself a certain degree of hand-waving and leave the final grade to the philosophers. My apologies to those of you who were expecting a rage- and alcohol-fueled screed. I really hope I'm not getting more measured in my old age. In conclusion, buy my book. 18A: With 50-Across, how one can tell that this puzzle was up all night waiting to be solved? (IT HAS CIRCLES / UNDER ITS EYES) ... thus, there are circles under the letter string "EYE" throughout the grid. I solved this puzzle as soon as it came out, at 10pm, so it wasn't "up all night waiting to be solved" at all. Like yesterday's puzzle, this puzzle's theme answers are almost too easy to solve. With the first few letters of the "answer" in place (in the NW), I got the whole thing. Then the only thing that was left to do was figure out what other layer there would be to the theme? What do the circles spell out? What does the central Across answer have to do with the theme? Turns out the answers are "nothing" and "it has EYE in it," respectively. 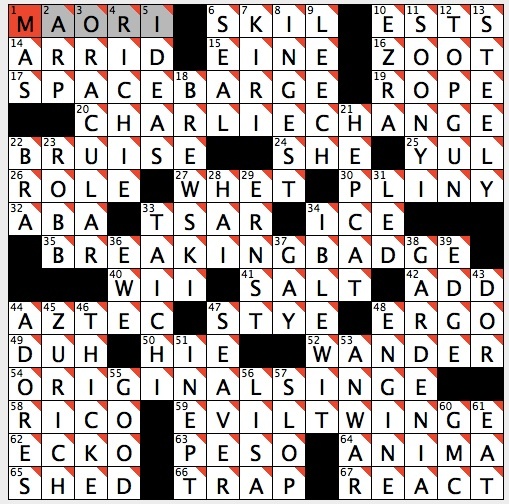 My fellow blogger tells me that the Internet Anagram Server's first offering, if you plug in all the circled letters, is A DREARIER SNOOZE, but I'd rate this puzzle somewhat higher than that. Unlike yesterday's puzzle, however, this one is solidly filled. I do tend to dislike exclamations like YECH and YEOW, since the spelling always feels improvised and arbitrary, and -ULE and ESTH. are gross, but most of the rest of it is OK. Wait, no—I take that back. AMORY WTF!? (63A: ___ Blaine, protagonist of F. Scott Fitzgerald's "This Side of Paradise") I would accept AMORY if the letters in the circles did anything besides sit there—that is, if it mattered what letters were in those circles. But it doesn't. Does it? So ... AMORY seems perverse. There's a certain quirky imagination at work in this puzzle, and I like that. The joke is corny and the puzzle was too easy, but I appreciate the attempt at originality here. Finished this one in just a few seconds over 5, which is (once again) about a minute to 90 seconds faster than my typical time for this day of the week. I attribute this speed almost entirely to the easily graspable theme, though the fill was all right over the plate, for the most part. I only struggled slightly, in weird places, with stuff like LBJ and VOLLEYERS and HEISS (44D: Five-time world figure skating champion Carol). Had some good guesses along the way. Got ISBN off the "S", ESTH. off the "H", etc. I knew who Stephanie MEYER and MIMI Rogers and SETH Green (6A: Green of TV's "Robot Chicken") and Ned YOST were—I suppose if you didn't, this could've played much harder. But I didn't know AMORY or IRENA (13A: "The Faerie Queene" woman) or HEISS and still didn't get held up. This is a Monday puzzle. With the exception of a few deliberately amped-up clues (e.g. 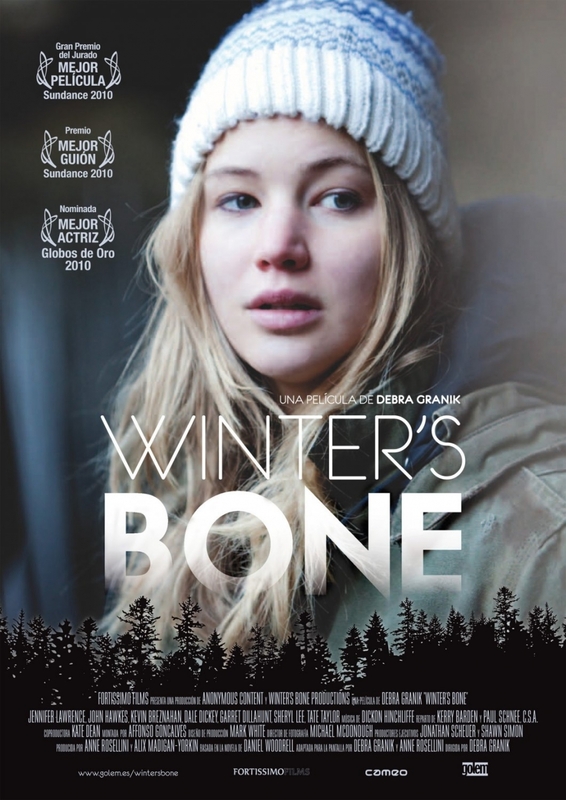 23A: "Winter's Bone" heroine ___ Dolly or 24A: Hebrew letter before nun), this thing has no speed bumps. Once you grok the theme (which doesn't take long), the rest of the theme answers reveal themselves instantly. I didn't have to think more than one second about any of them. Gimme after after gimme after gimme. That's a lot of long gimmes. So it's misplaced on a Wednesday. I nearly broke three minutes, which maybe I've done once in my life on a Wednesday. Typically I'm more than a full minute slower. But that's not a fault of the puzzle's. And yet it is, because the theme is terribly obvious, and one that I have to believe has been done before, many times. It does have the up-side of giving us lots of Xs and Ks, but since all answers were so easy to get, there's not much pleasure to be had in solving. Then there's the fill, which ... well, at this point, I doubt I have to tell you. Another day, another dire situation. I won't bother enumerating the damage, but there's at least half a dozen to maybe ten answers here that I would try desperately to eliminate if I were constructing. At least three in each of the tiny SE and NW corners alone. So, six, right there. And there's more. Plus, in addition to short junk, there's problems with the longer stuff. IN A TREE and RETOTAL are *total* wastes of good long-Down real estate (though I will say that most of the other 7s are just fine). "Good enough" just isn't good enough. Surely people can sense how *tired* a puzzle like this is. Adequate, passable, defensible, but at best Just OK. Something you might've seen 30 years ago, not in that the fill's old, but in that it seems to come from an era when puzzles underwent less scrutiny, when there was less basis for comparison, and when standards of polish and zest were generally much laxer. The idea appears to be "Playful theme + defensible fill = all you need." But it's not enough any more. I don't know why we're still seeing Just OK puzzles in the NYT, but I'm grateful that more and more people seem to be noticing. As they say: write your congressperson. How about a 12-step program for people addicted to bad fill? We could name it after the 5th row of this puzzle: REEMEMANON. "Hi, my name is ..."
10A: Strained-at-bug, in an idiom (GNAT) — I am not familiar with this idiom. It's from Matthew 23:24, "Ye blind guides, which strain at a gnat, and swallow a camel." That last part must be tricky. 9D: Keebler cracker brand (ZESTA) — the snack preferred by both Perle MESTA and the hearth goddess VESTA. The Yazoo River is a river in the U.S. state of Mississippi. The Yazoo River was named by French explorer La Salle in 1682 as "Rivière des Yazous" in reference to the Yazoo tribe living near the river's mouth. The exact meaning of the term is unclear. One long held belief is that it means "river of death". Just a quick write-up this morning. I don't think this works, on many levels. 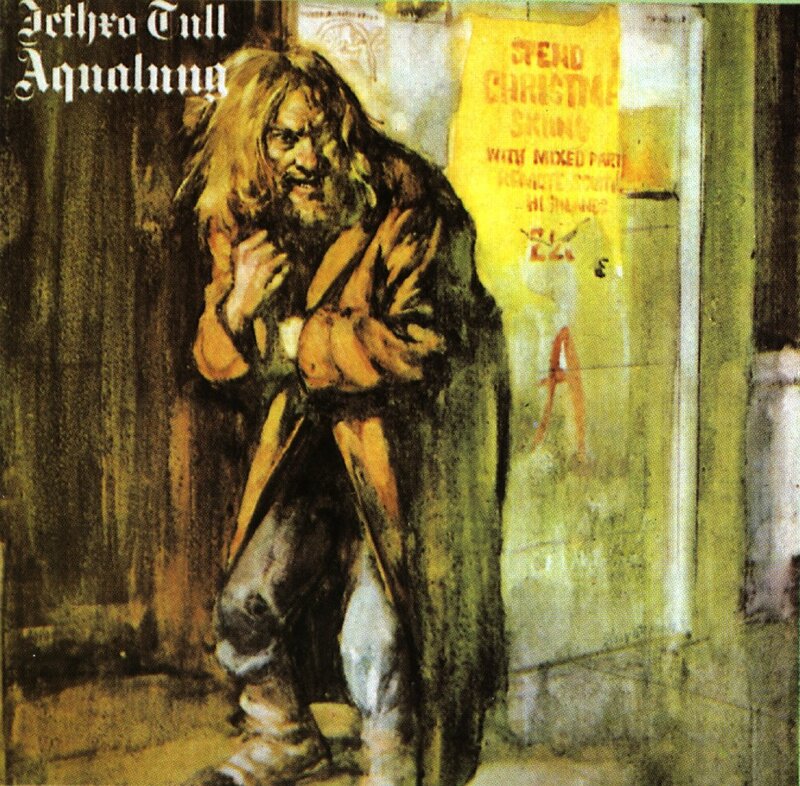 This is the kind of theme that seems like it belongs to a much earlier era (in fact, I've seen it done at least once before, and would be shocked if it hadn't been done many times). It involves an obvious and not terribly interesting set of words that have something in common. If you're gonna build your theme around such a set, you need to *do* something with those words. Put them in non-question phrases, hide them inside other phrases, make sure the "questions" all have something (anything!) in common ... But what we have here is nonsense. Completely and UDDERly arbitrary who what where when why questions. They could've asked Anything. Where am I? What now? Why not? Who cares? These questions have nothing to do with anything. Not with each other, not with journalism. I'm not even sure 52A is really a question. It's a rhetorical question. 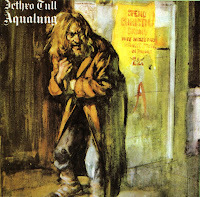 Which, I guess, has "question" in the title, and so is, in fact, a question, technically, but you see what I mean. Then there's the fill. Three answers destroy this puzzle for me (and would destroy virtually any puzzle for me): E-DATE (!?!?) (32D: Online time stamp), ODESA (twice in one year with this thing?! Come on...) (34D: Black Sea port, to locals), and ALOE VERAS (63A: Soothing lotion ingredients). If one of the questions in this puzzle had been "WHERE ARE MY ALOE VERAS? ", all would be forgiven. "WHO SAYS 'ALOE VERAS'?" "WHY WOULD YOU DO THAT?" Etc. See also EFT, ECRU, I SAW, I THE, ELHI, ARETE, and on and on. I do like the answer SOUND BITE (37D: Media-friendly quote), and the clues on POLICEMAN (10D: One keeping the beat?) and UDDER (35D: One may be above a bucket) and TONTO (16A: Fictional member of the Potawatomi tribe) are nice. In the wake of the absolutely horrendous tornado destruction in Oklahoma yesterday, all I want to do is remind you that "American Red Crosswords" exists. It's a collection of 24 puzzles I put together to benefit the Red Cross's Disaster Relief Fund after Sandy, but the money is used to respond to disasters everywhere. You can donate to the fund and grab the puzzles in .pdf or iPad/iPhone form here. Thanks.